Several months ago I turned my very nice tablet, the HP TouchPad, from a pleasant-to-use device into a handheld computing god thanks to the Android CM9 port of Ice Cream Sandwich. Since then, the device has gone from strength to strength, enabling me to enjoy movies and TV with Netflix, listen to the radio and of course play games and even do some work while I spent a week in the south west of England. Recently, however, it has come to my attention that there is yet more that can be achieved with this most flexible of tablets. Whether you’re persisting with the super-slick webOS and its limited selection of apps or if you’ve upgraded your pretty amazing tablet to Android 4.0, there are several alternatives that you might be interested in. Whatever you decide to do after reading this guide, you simply must start off by following my previous article on installing Android 4.0 Ice Cream Sandwich to the HP TouchPad. This represents the optimum level of performance that you can expect to squeeze out of this device, and the process is a great grounding in installing a new operating system to your tablet. Basically, if you don’t follow the previous guide what comes next will seem a little tricky. You’ll also regret it, as Ice Cream Sandwich on the HP TouchPad is as perfect as….well, an ice cream sandwich! You might think that having two operating systems running on the HP TouchPad is good enough – but would you believe that a third is available? Remarkably, the popular Linux OS Ubuntu can be installed on the HP TouchPad. With this installed, users will be able to enjoy using applications such as AbiWord, Chromium Browser, GIMP, even the LibreOffice suite! Indeed, any Linux application that can be compiled for ARM processors can be installed, bringing the feel of a very portable desktop computer to your HP TouchPad! Other versions of Linux have been ported to the HP TouchPad, such as Arch Linux, but note that both Linux versions have a few hardware issues that make things like graphical hardware acceleration impossible. Ideal for office-based tasks, these Linux operating systems don’t have the same power on the HP TouchPad as Android 4.0. Don’t let that upset you, however. While Ubuntu is great on the HP TouchPad, there are plenty of alternative versions of Android that you might try. The beauty of the XDA-Developers.com forum is that the guys there spend hours of their lives configuring and reconfiguring Android to work as efficiently and impressively as ever, often incorporating tweaks to the user interface as they go. One particularly astonishing piece of work is AOKP&CM9Remix with WebOS Style. This remarkable piece of work combines Android Ice Cream Sandwich for the HP TouchPad with a webOS-style card-based user interface. Installation of this ROM is as simple as upgrading your HP TouchPad’s current version of Android, and shouldn’t take more than five minutes or so – the results are amazing! However, we shouldn’t ignore CM10. This is a HP TouchPad build that will bring the delights of Android 4.1 Jelly Bean to your tablet. At present it isn’t up to daily use, but the team behind it are working hard and the early signs have been impressive. HP TouchPad Just Keeps On Giving! All in all there are many alternative versions of Android that you can use on the HP TouchPad, from the basic Ice Cream Sandwich to the various builds that add additional features and performance boosts. You will be able to find them all via the XDA-Developer’s website. Given the HP TouchPad’s initial poor sales, it is remarkable that over a year later it is still widely in use as an Android tablet rather than running webOS. Sadly, the native operating system looks unlikely to ever be favoured by the device. 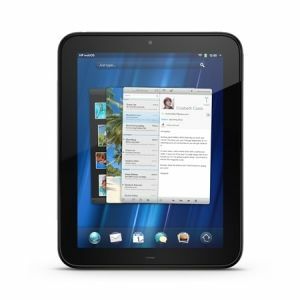 The recent act of making webOS “open” has resulted in HP announcing that a new version will not be made available for the HP TouchPad; the hardware producer continues to consider the tablet a failed product, despite its popularity. So it’s just as well that enthusiasts are keeping it alive with all of these operating systems and ROM alternatives! Interesting,can you do this for all or only for hp? Some tablets will run Ubuntu or other Linux desktop distros, but these suggestions are specifically for the HP TouchPad. That is the idea about linux. Open source yet meets the needs of a consumer. Hey this is great. i like it!